The best thing is that there’s no melting and cooling phase like when making a body butter (which is so lovely, please make it) or even a lotion. This is more your quick “blend and slather” recipe. No fuss. That said – I really recommend that you infuse your oil first with vanilla beans to give it a sweet, exotic scent. Want more step-by-step guides to make your own natural beauty products? Shea Butter – a small tub of shea butter can last you for ages, it’s so rich and nourishing you only ever need a tiny bit. Use it straight from the tub to soften your cuticles, on dry patches of skin, even as a deep-treatment for your hair. In this recipe, we’re adding it to give your cream it’s richness and deep moisturising effects. Shea butter is packed with vitamin A, known to be helpful in helping healing wounds, bug bites, skin rashes, ezcema and stretch marks! 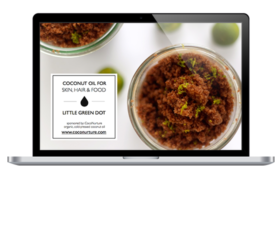 Coconut oil – You can really use any oil that you like. Read my top 6 favorites here. Almond and safflower are good for all skin types. Avocado for dry skin. Grapeseed oil is great for oily skin. I really love coconut oil – I always have a bottle of it on the go in my kitchen and I love its skin moisturising, nourishing and cleansing properties! After blending, you’ll have a rich and thick cream. If you find it to be a little too oily on your skin – add in a bit of arrowroot powder and it will dry with more of a powder finish. It feels so gratifying to make something beautiful, natural and good. It’s a real fist-pump in the air – I can’t believe I just made this – moment that I hope you have :) Give this hand & skin cream a go and see if it works for you! 4-6 tbsp oil more or less depending on how thick or runny you want it. store it in a jar, will last for one or two weeks. Make small batches! You can use coconut, or another – or make a blend! ps – I once tried to infuse my shea butter – never do that! It gets wasted, you start with 1 cup and end up with 1/4 cup! Infuse the oil instead.